I bet someone here knows what this is. 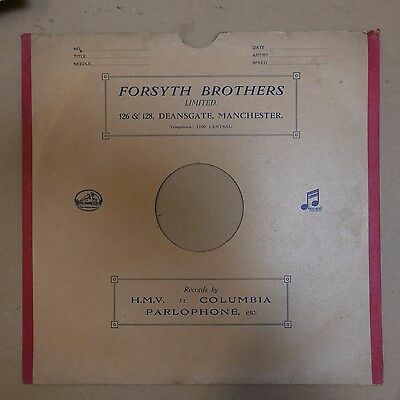 It seems to have turned up as a curio in the window of Forsyth's, a large and venerable music shop on Deansgate in Manchester. Sorry the pictures are so bad - being through glass I could not use flash and the exposures were rather long. It appears to have a 30s-style speaker grille and what looks like a tuning dial escutcheon, and most of the knobs are missing. There's a very 'portrait' glass screen at the front end of the bellows, and inside at the other end of the bellows there might be a mirror. The bellows has no base, only two sides (and the top is wooden). Re: Odd, old, case in luxuriant veneered...what is it? Mirror drum 30 line TV, there is a picture in "The Setmakers", grab it and make it work! Looks in timewarp condition too. Wow, you're right. p223 - Bush de-luxe 30 line receiver, 1933. On the next page '...very few if any at all of the 100 sets made were sold, though some were exhibited in the foyers of Gaumont British cinemas'. (Oh - I also now know that the first play broadcast over the 30 line system was a drama about a man who fantasised about killing his wife and was dying of skin cancer. I just watched a 60s remake (still 30 lines) with my daughter ). The Bradford museum knows of their own example, and the upper portion of one other. This is a major find. It might be worth ringing the shop and letting them know what they've got, if they don't know already. Otherwise there's a risk it'll end up in a skip if the shop closes or even has a refit. If it were ever for sale one hopes the rarity and the high reserve would discourage upcyclers. (But you never know.) I can almost hear one of them chewing a hole in the back door of the shop. Must be an extremely rare survivor. It actually shows up in one of the photos of the shop on google images, so i imagine it's been there a while, as a display item. At least people get to see it that way, whether it's restorable or not. Last edited by The Philpott; 9th Jan 2019 at 12:52 pm. Maybe it was a trade-in a very long time ago?! Would any of the early TV hertiage groups be interested? Could the mods add the identification to the title, maybe? I've just alerted the NBTVA Chairman, to check this is known about. I hoped this would be the place to make the right thing happen. One of the first job interviews I attended after leaving school was at Forsyth's. Had I secured the job, one of the things I would be doing was reconing loudspeakers, a concept I was unfamiliar with at the time. I passed by last Saturday, and thought briefly about that long ago interview, and even had a tinkle on their "Street Piano" but I did not see the Televisor, perhaps I should have gone to Specsavers? My guess is that they know full well what they have there, and its provenance will be forthcoming on request. Last edited by rambo1152; 9th Jan 2019 at 6:30 pm. I presume that would be "The Man with a Flower in his Mouth"
Given that this is not a charity shop it might be best just to ask if they're willing to sell it. You'll soon find out if they know what it is. Otherwise I can see the price heading Northwards. If I lived nearer I'd have already visited the shop. Just 'wow'! That is a truly incredible find and of great historical importance. I really hope this can be acquired and put into safe hands. Although it does appear to have been well preserved and cared for. Will be good to read more on this. If this was definitely known to be for sale I'd be tempted to get in the car now, but it would be one hell of a drive!! I'm needed in the south but If Marc loses his nerve I might be able to send in a SWAT team [ie Save Wireless Antique Trophies]. My brother Phil and I have met him at his great house in Salford. A "proper chap". According to a brochure for the Bush TV12, the makers claimed to have been the first to manufacture a commercial TV 'in 1933'. Must be this one! I remember the Setmakers period photo but seeing one 'in the wild' is very exciting. Did it come before or after the bacon slicer? I would have assumed after. Thankfully they’ve already had a refit so it either survived or was recently found. We are celebrating our 160th anniversary in 2017-18 with an on going refit of the store, including the recent replacement of our shop sign, which had survived since our 100th birthday in 1957. I’ve no knowledge of TVs at all but this seems special, I hope Mark can make it or someone can call to advise them that they have something important (if they don’t already know) before some unscrupulous person reading this public thread gets there first. Also the first publicly available LCD TV of course.